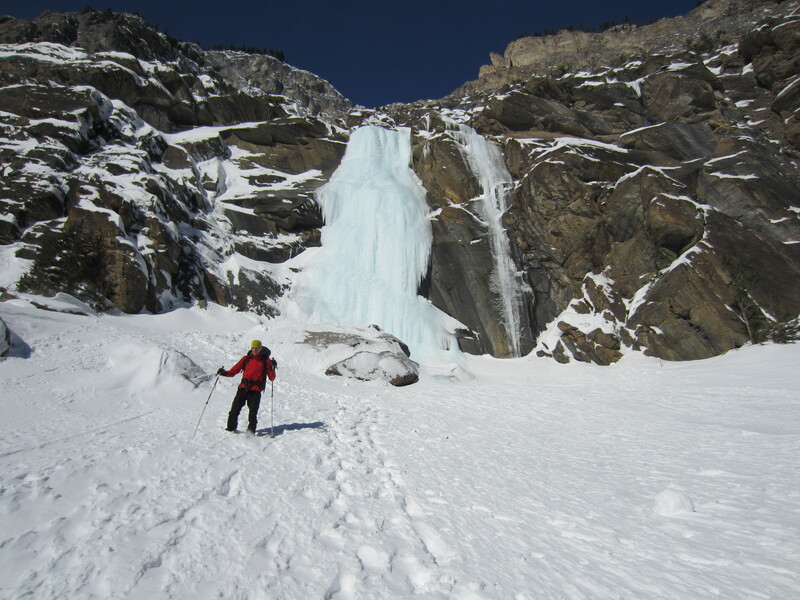 After the ski-mountaineering race in Golden, Paul Backhouse and I did some ice climbing in the Rockies. Paul hiking down after warming up with an ascent of Silk Tassel near Field. 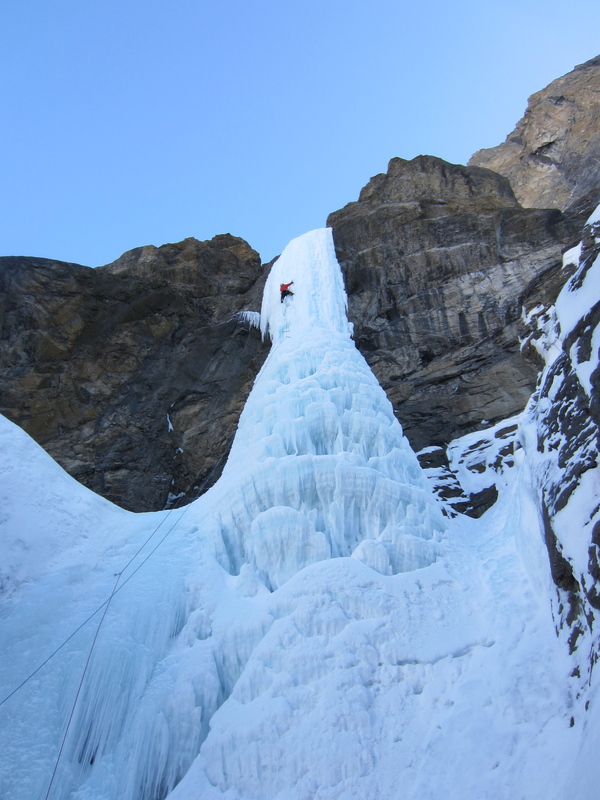 For a few consecutive seasons, I spent quite a bit of time ice climbing in the Rockies. I took many overnight greyhound buses from Vancouver to Canmore during reading weeks at school. I slept in my friend Stefan’s van, in employee housing in Lake Louise (where slipping on someone else’s frozen urine on your front door step was a recurring cause of injury), and I even spent a month living in the Canmore trailer park with some French-Canadians. I may not have been much good at ice and mixed climbing, but I did a lot of it. 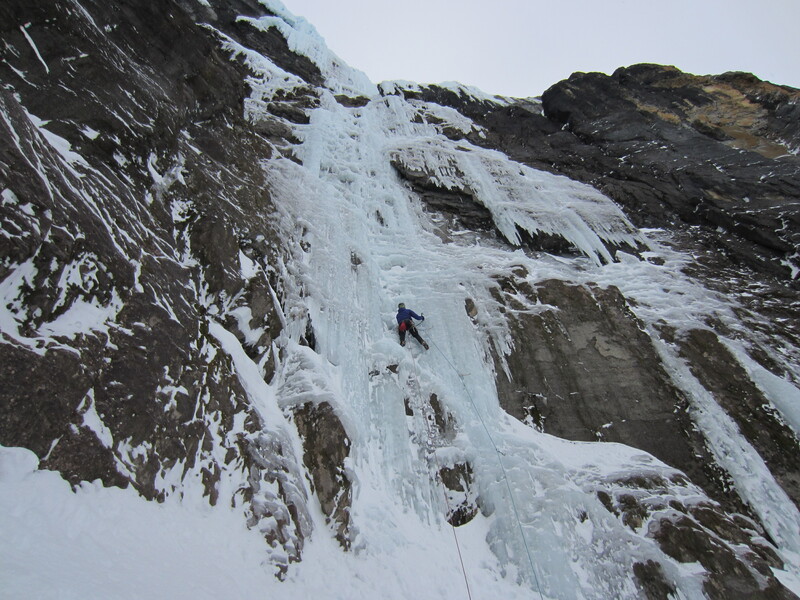 Paul starting up the first pitch of Nemesis on the Stanley Headwall. During the past few years, I’ve only managed to make occasional, brief trips. This time was no exception, but it was enough to remind me of why I used to go to so much trouble to climb there. Although a couple of things we had hoped to climb had either collapsed or were not touching down, there were still so many good climbing options that each day it was difficult to decide what we wanted to do the most. Paul climbing the third pitch of Nemesis. The range is justifiably famous for its scenery. Unlike the steep-sided V-shaped valleys of the coast where you can drive along the roads oblivious to the vastness of the alpine landscape above, the broad open valleys of the Rockies mean that views of the high peaks are ever-present. I think that the visual prominence of such impressive mountains has as much to do with the strong tradition of alpine climbing in the Rockies as does the actual quality of the climbing (they also don’t have the distraction of quality granite rock climbing like we do on the coast). The day after the race, Paul somehow convinced me to climb Nemesis, a classic pure ice route that neither of us had done before. The climb was excellent, although both my body and mind were exhausted. Thankfully Paul can always be counted on to be highly motivated. Given how pathetic I was throughout the day, it seemed somehow fitting to top it off with a few face-plants during a headlamp-illuminated ski down to the car through bottomless facets on my race skis. The Pencil on Polar Circus. 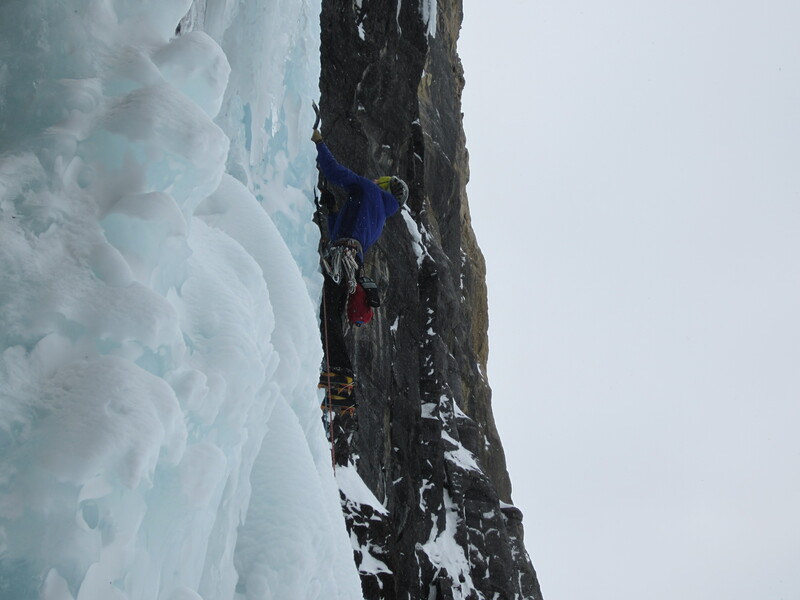 We enjoyed a couple of days of cragging in Field and at Haffner Creek, but for me, the other highlight was an ascent of Polar Circus. 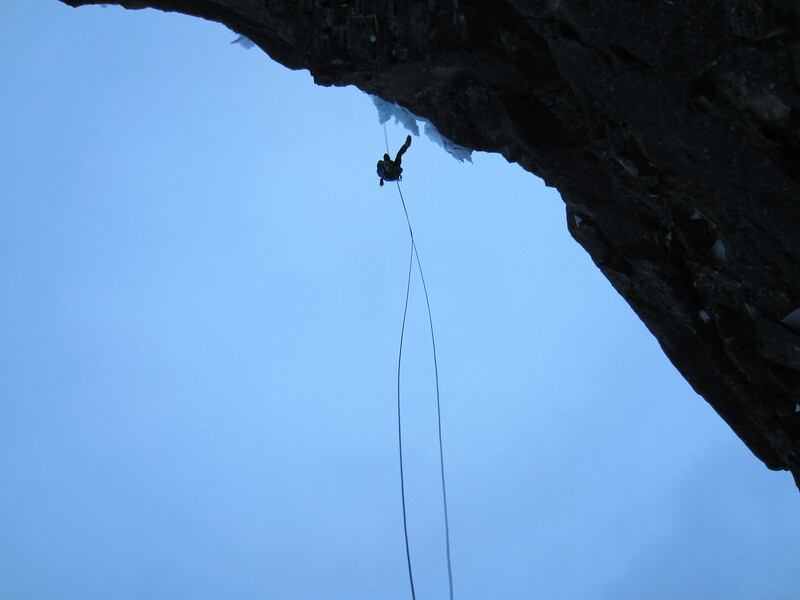 Although I’d climbed the route a couple times in the past, this year a feature called the ‘Pencil’ was formed. 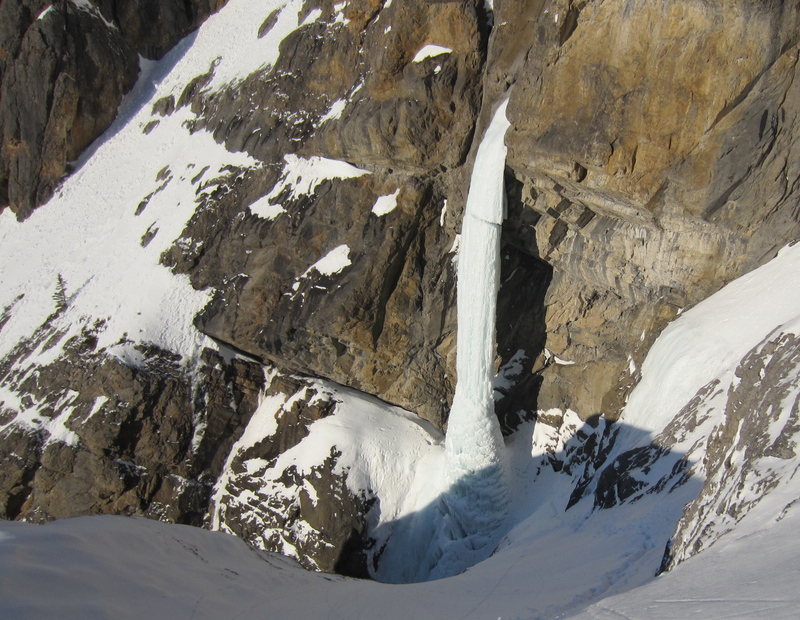 Part of the perverse appeal of ice climbing is the ephemeral nature of the routes; when something like the Pencil (which I believe last formed in 2005?) is in good condition, it feels like a rare privilege to be able to climb it. Of course, everyone wants the privilege, and the pillar was fairly hooked out and not really too bad at all. Seeing as I’m weak and a wimp, that suited me just fine.